The Cawley/LeMay 400 and 600 woodstoves are uncompromising in quality. They are 100% cast iron stoves made in America to last for generations of use. 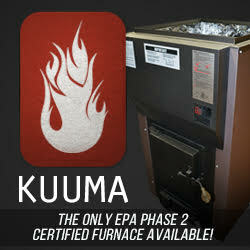 These fully baffled, airtight woodstoves burn slowly and efficiently from front to back. The machined draft control wheel and draft distribution plate work in combination to effectively divide the incoming air for use in both primary and secondary combustion. The large fireboxes of the Cawley/ LeMay woodstoves require less frequent loadings. However, the internal side baffle plates may be reversed to make a smaller firebox, giving you the added flexibility of two basic heat outputs. A grid in front of the top baffle increases efficiency by aiding secondary combustion and transferring additional heat to the stove s surface. The large 9/2 x 10/2 door is at a comfortable height for loading and has a small glass window allowing you to view the fire. Ashes that may spill while tending the fire are caught by the sweep shelf where they may be safely removed. The Cawley/LeMay 400 and 600 woodstoves are cast in iron specifically formulated for structural integrity and thermal qualities required for woodstoves. (These parts are carefully engineered utilizing structurally as well as visually pleasing forms.) All the joints are of tongue-and-groove interlock construction. The Cawley/LeMay woodstoves stand at a comfortable height for cooking. The raised and rounded edges surrounding the stove top insure the safer use of several pieces of cookware. Cooking temperature can easily be controlled by moving your pans to different areas on the top, or by removing the machined cooklids and placing the pans directly over the fire. The strong traditional lines of the 400 and 600 woodstoves are enhanced by the delicate sculptured artistry of wildlife artist Martha Cawley. The Cawley/LeMay 400 and 600 may be seen and purchased at an authorized dealer near you. Please circle the reader service card for the dealer nearest you, or send for our complete information packet. Please enclose $1.00 to cover postage and handling. Log Length Cap. : 19 in. Heating Range: 3500 to 7500 cu. Door Size: 9/2 x 10 in. 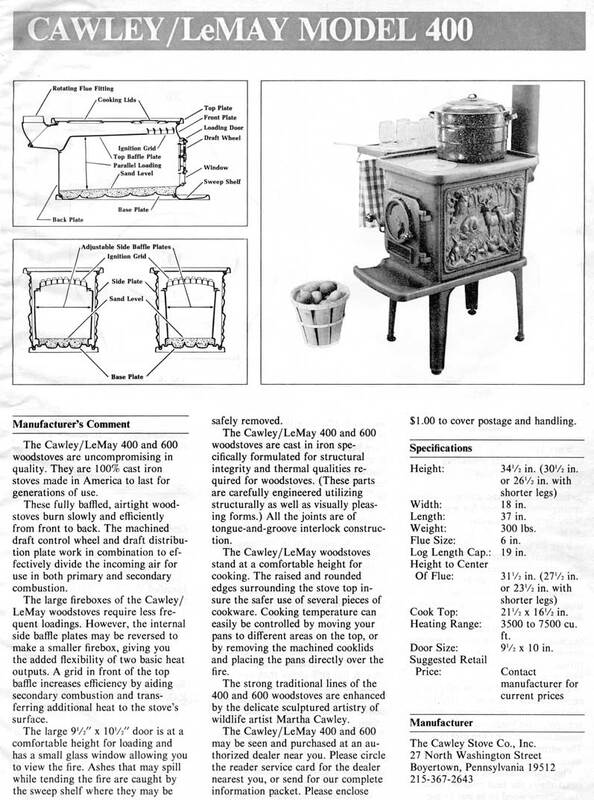 The Cawley Stove Co., Inc.